Michael McCleery is a retired Ector County Deputy Sheriff where he served as a Fugitive Investigator tracking down and arresting wanted felons. Michael also served as a member of the Ector County Sheriff’s SWAT TEAM. 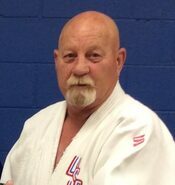 Michael became a student in OBC Judo in 1965, at 11 years of age, Michael’s Dowling Elementary Coach Max Ford encouraged him to join the Odessa Boys Club and take Judo Lessons. From 1965 to 1973 Michael McCleery, was a dedicated student and trained under the strict and intense physical training needed to compete locally, state wide as well as Nationally. 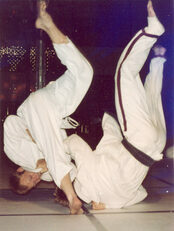 He traveled with the OBC Judo Team and competed in Judo Tournaments all over Texas & the United States. In 1973-1974, he traveled to Tokyo, Japan and trained at the Kodokan, where he earned his 1st Degree Black Belt at 19 years of age. 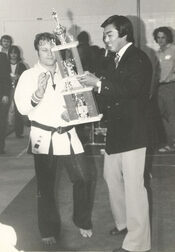 In 1976, After two years of daily training and nationwide competition Mike traveled back to Japan at age 21 to earn his 2nd degree Black Belt. He spent the next two years training at the Kodokan and traveling around Japan competing. In 1980 the United States Olympic Judo Organization chose 8 elite competitors from each weight division from around the United States to train daily at the United States Olympic Training Center for 4 years. Mike was one of those elite athletes chosen. During Michael McCleery's 53 years in Judo he stacked up over 200 Medals & Trophies along Titles at Major tournaments such as; 13 Gold Medals, 4 Silver Medals and 2 Bronze Medals in the Texas State Championships; 2 Bronze Medals in the Senior National Championships; 1 Gold Masters Championships; 4 Gold Medals in the Florida State Judo Games; 2 Bronze Medals in the U.S. Olympic Pre-Trial Games; 1 Gold Medal at the Mexico City, Mexico; 1 Gold Medal 5-man Team at Monterey, Mexico; 1 Gold Medals at the American-Canadian Championships; Gold Medal 5 times in 2 Divisions for 5 consecutive years in Los Vegas. On a Thursday night May 24, 2007 United States Judo, Inc. and Texas Judo, Inc., promoted Mike McCleery to 6th Degree Black Belt. In September 2013, I went into semi-retirement from Judo and passed the leadership and daily operations of OBC Judo to Michael McCleery. 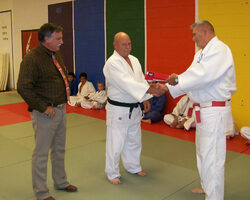 The Judo Club currently has 75 members registered with USA Judo. Michael is a National Level USA Judo Coach. On May 3rd, 2018, The Odessa Boys & Girls Club Awarded Michael McCleery for being “Club Champion Volunteer of the Year” for his 53 years of dedication to the sport of Judo at the Odessa Boys & Girls Club. On Thursday night 30 August 2018, USA Judo National Promotion Board promoted Michael McCleery to Shichidan; 7th Degree Black Belt.